Dr. A.B. Prabhu, MBBS, MS(General Surgery), MCh(Plastic Surgery), is a Consultant - Plastic & Reconstructive Surgery at Fortis Hospital, Mohali. 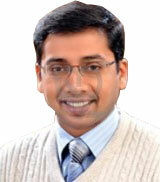 Dr Prabhu completed his M.B.B.S. from St. John's Medical College, Bangalore and then accomplished MS (General Surgery) and MCh (Plastic Surgery) from the renowned Post Graduate Institute of Medical Education and Research (P.G.I), Chandigarh. Dr Prabhu has done his Junior and Senior Residency in PGI and went on to become Registrar in Plastic and Reconstructive Department of PGI.